Start: In September 2007, I decided to create a blog to better understand global water problems with the hope of finding solutions. I built the Water for the Ages blog as a place to compile water-related information and write posts about global water issues. This blog also surprisingly became a place to communicate with other passionate H20 people from around the world. Reach: Soon after starting it, I enrolled in a graduate program in Water Resources Management to learn more about global issues. I lived and blogged in India for several months while conducting research, and I completed a thesis on empowerment in water and sanitation. India changed me. After coming home, I wondered how one young, white girl from North America could ever make a tangible difference. I didn’t want to be another person with an imperialistic agenda. Grow: Over the past year, I blogged little while doing a quite a bit. I worked in the renewable energy sector with the hope of learning about the energy-water nexus. I volunteered with an amazing sanitation advocacy group called PHLUSH. I received a scholarship to attend a graduate program in Environmental Sociology at University of California. The most difficult of all, I engaged in self growth. Learn: I eventually realized that people can solve problems best when they work together, each person has different useful strengths, communication is everything, and it’s important to “be me”. So now I’m in Santa Cruz preparing for my graduate program, and I figured it was a great time to revitalize Water for the Ages. When I signed on, the many comments from inspiring people over the past few months reminded me that I was on the right track. Ta Da: So I present to you the new-and-improved Water for the Ages blog. I even added a nifty calendar on the upper left right which shows you important global water and sanitation events. I imported this information from IRC International Water and Sanitation Centre and UN Water. I can’t promise how regularly I’ll be blogging, but I figured resources here are handy. I’m remembering – it’s the little things that count. From June 25 to June 26, leaders from eight of the “major advanced economies” in the world will converge for the G8 Summit in Canada to discuss important matters. PM Harper from Canada said this year’s Summit will focus on “key challenges related to development, and international peace and security.” All priority issues for the Summit – development, the health of mothers,/newborns/children, food security, Africa, and peace/security – relate to water and sanitation. Still, each year, G8 Summits provide an opportunity for civil-society organizations to coalesce and urge respective governments to talk about issues that matter to them. A number of groups are focusing on water and sanitation at the G8 in 2010. Interaction, a coalition of 180 NGOs working to alleviate global poverty, has prepared a brief on water and sanitation that calls for the US Government to be vocal on water and sanitation at the Summit. And a G8 World Religions Summit of global religious leaders began yesterday at the University of Winnipeg. Leaders represent Christianity, Judaism, Hindu, Sikh, Buddhist, Islamic, Shinto and indigenous faiths. This alternative Summit will be aired live online here. They hosted a water-ceremony on the opening day of this alternative Summit. For more information on last year’s G8 Summit and water (and sanitation), please see this blog post. Updates on water and sanitation discussions at the Summit will be added as they become available. On the 26th of June, leaders from G8 countries wrapped up the summit and issued a Declaration. They pledged support towards meeting Millennium Development Goals. They affirmed a common desire to achieve aid-effectiveness for development in Africa. They discussed the importance of meeting MDG 4 reducing child mortality and MDG 5 maternal health, but did not indicate water and sanitation as integral to such efforts anywhere in the main Declaration. They launched the Muskoka Initiative to further progress on meeting MDGs 4 and 5 and linked this Initiative to MDGs 1 (childhood nutrition) and 6 (HIV/AIDS, malaria). They mentioned the importance of drinking water and sanitation once stating “relevant actions in the field of safe drinking water and sanitation” among other things are important towards meeting the aforementioned MDGs. But they did not identify a link between MDGs 4 and 5 to MDG No. 7 to halve the population without drinking water or sanitation. Many NGOs including World Vision feel the Muskoka Initiative is under-funded with 5 billion pledged towards meeting these commitments with half of that amount from Canada). Here is a good review of different NGOs and their take on the Summit and subsequent Initiative. Life has been bustling as I prepare for an internship in India. This year, I was accepted for an internship with Arghyam – an NGO that works on water and sanitation projects across India – in Bangalore. This internship is part of my master’s studies at Oregon State University (my major is Water Resources Policy and Management and my minor is Women Studies). It will last from September 1st until December 31st. 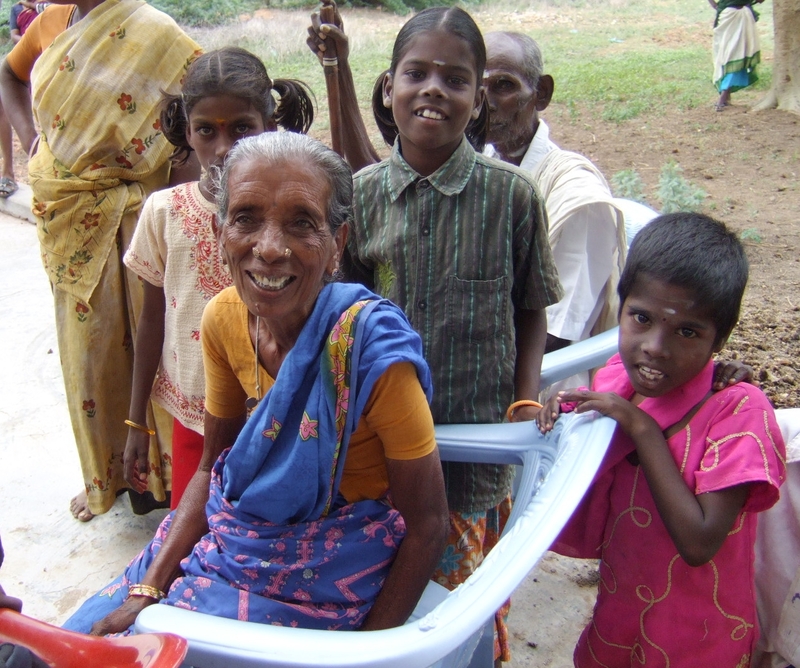 My internship with Arghyam will focus mainly on gender and water issues in South India. Such issues are important to understand to ensure all people have fair access to and participation in the management of water and sanitation resources. Through my adventures, I will continue to post on Water for the Ages (both on my internship and other international water issues). Stay tuned for more information to follow. There will be photos, videos, and more. If you are interested in an international water internship in India, Arghyam has other internship opportunities available. Be sure and check out their impressive India Water Portal for details on these positions. Are you ready for a global-water multimedia adventure? Already today, I have been able to visit people and places in Yemen, India, Mexico, Niger, and Kenya to learn more about local and global water issues. How, you may ask? Easy, I reply – The Water Channel. The Water Channel is a partnership between MetaMeta Communications, UNESCO-IHE, Cap-Net and Nymphaea. It has videos from around the world on water topics ranging from Integrated Water Resource Management (IWRM) to watershed education and outreach. Water is a Gift: An artful animation about water produced by the Natural Water Resources Authority in Yemen (complete with English subtitles). This film juxtaposes drawings and digital video to talk about the significance of groundwater and drip irrigation in Yemen. Tears (Lagrimas): A “fictional” film about a young girl wistful for the days when she was able to access water at a local source. This video has no words, only images, and was shown at fourth World Water Forum in Mexico. Kenya: What Water Means to Me: One teacher at Karen ‘C’ Primary School in Kenya documents her students’ views on water. These students discuss the role of H20 in their daily lives: water shortages at school, water shortages at home, water-borne illnesses, and possible solutions to these water problems. If you want to see others, visit the 164 videos (and counting) at The Water Channel website. As readers of Water for the Ages may have noticed, I’ve been on an extended holiday break (to visit family in East Tennessee). Arriving back to the Pacific Northwest, my mailbox was full with letters, bills, Christmas Cards, and other postal paraphernalia. Yet, to my surprise, there was one mysteriously large and somewhat heavy package addressed to me. 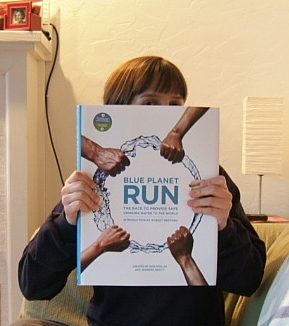 Soon, I discovered this large package was a massive, coffee-table sized book called Blue Planet Run: The Race to Provide Safe Drinking Water to the World published by the Blue Planet Run Foundation in San Francisco, California. The Blue Planet Run book was published to raise money to assist in meeting the Blue Planet Run Foundation’s goal of providing safe drinking water to 200 million people by 2027. One hundred percent of all royalties from the sale of this book will be used to fund drinking water projects around the world. Opening the book, I was immediately transported around the world through the vivid photographs that graced cover to cover. These images, taken by photojournalists over a period of one-month last year, tell the stories of rapid development and its effect on water supplies, dam construction, access to water in crowded cities, new water technologies, and leaders who are making strides in water access and supply. Several essays are also featured throughout the book written by authors including Robert Redford, Diane Ackerman, Paul Hawken, and Bill McKibben. And, after coming home to indoor plumbing and plenty of fresh water, this book helps me remember (during this holiday season) just how lucky I really am. Zimbabwe is encountering a severe water and humanitarian crisis. Two weeks ago, the High Court in Zimbabwe shut down because of a lack of water supply. And, over the last month, approximately 8,887 people have contracted cholera and 366 people have died. Four large hospitals and many local clinics in the country have closed or turn away new patients because of a lack of medical supplies. The cholera outbreak is spreading fast because of poor water and sanitation conditions around the country. Government-run water treatment facilities have not imported enough chemicals for treatment, raw sewage is found in neighborhoods as sewer lines are broken, and many individuals do not have access to clean drinking water. There is no stable government in Zimbabwe to provide these basic governmental services. Robert Mugabe, of the ZANU-PF party, held power in the country for the last 28 years. In March, Morgan Tsvangirai, of the Movement for Democratic Change, won the first round of elections. But after much violence and intimidation against his supporters, Tsvangirai decided to concede. Both parties agreed to a power-sharing agreement in September, but Mugabe did not grant Tsvangirai adequate access to governmental offices. Now the two leaders are attempting to discuss the power-sharing agreement in South Africa; meanwhile the country waits in despair. As I recently found out from the great network H-Water, there is a new wiki dedicated to the history of water at Wiki.Water History.org. This wiki covers water issues, the historic era, water technology, water location, biographies, and multimedia. It’s an update project to the previous Water History.org web page.